The Lenovo Z5 Pro GT is all set to launch in January 2019 with Qualcomm Snapdragon 855 chipset. We are comparing the device with the flagship killer OnePlus 6T too see which one would win the battle on paper? The Lenovo has announced its first flagship device of 2019 “Z5 Pro GT” during the launch of Lenovo Z5s in China. The Lenovo Z5 Pro GT is the world’s first smartphone with 12GB RAM and 855 Qualcomm chipset. On the other hand, the OnePlus 6T, which was launched a couple of months back in India comes with the latest Qualcomm Snapdragon 845 processor and in-display fingerprint sensor. 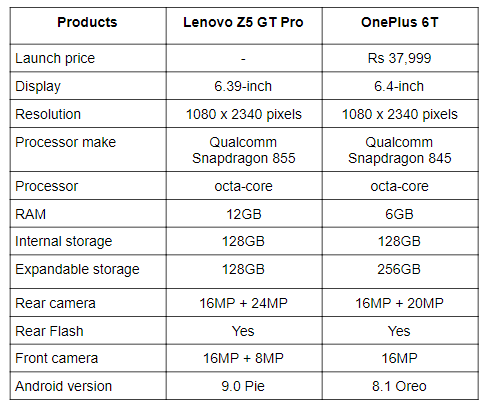 Let’s just do a quick specs comparison to know which device offers the best? The Lenovo Z5 Pro GT sports a 6.39-inch display that offers a resolution of 2340 x 1080 pixels. 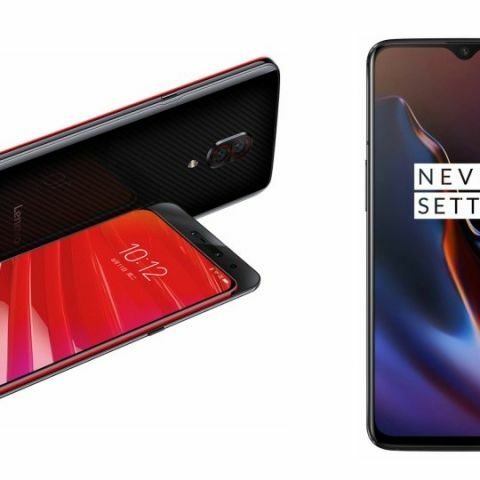 On the other hand, the OnePlus 6T features a slightly bigger 6.4-inch notched display that offers the same resolution as the Lenovo Z5 Pro GT. It also has a water-drop notch on top of the display, which gives you more viewing area and a higher screen-to-body ratio. When it comes to the processor, the Lenovo G5 Pro GT is the world’s first smartphone, which will feature a Qualcomm Snapdragon 855 processor. The phone will be launched to up to 12GB RAM model. The OnePlus 6T is backed by the latest Qualcomm Snapdragon 845 processor, which is coupled with 6GB RAM and 128GB internal memory. As far as the cameras are concerned, the Lenovo Z5 Pro GT comes with a dual 16MP + 24MP rear cameras along with a dual 16MP + 8MP units on the front. On the other hand, the OnePlus 6T has a dual 16MP + 20MP rear cameras and a 16MP sensor on the front. The Lenovo Z5 Pro GT price has not been revealed by the company yet. However, the smartphone is supposed to launch in January 2019. On the other hand, the OnePlus 6T is available in India for Rs 37,999. Lenovo vibe z2 pro vs galaxy note 3 which is best buy.